Estimates are credit card fraud is a $16 billion per year crime in America. If your club hasn’t reviewed its credit card transaction system recently, the current lawsuit filed against Royal Links Golf Club in Las Vegas, Nevada may cause pause. After a golfer paid for his guest fee, he noticed the first six…and last four digits…of his credit card number were on his receipt. Realizing the receipt failed to comply with the Fair and Accurate Credit Transactions Act, he filed suit – even though no fraud had been committed. The law states only the last four digits of your credit card are permitted to be printed on a receipt. While it’s likely the suit will be dismissed by the court, the cost (in time and money) to management is significant. – 15,014 – number of regulation golf facilities (3,670 private, 11,344 public). – 737 – the net decline in total golf facilities since the end of the Great Recession. – $25.7 billion – spent on golf-related tourism in the U.S. in 2016. – $210 million – spent on new golf course construction in 2016. Way down from a high of $5.6 billion in 2000. This year, Las Vegas will attract more than 42 million visitors from around the world. Sandwiched between every imaginable diversion known to man, approximately 900,000 vacationers will opt for a round of golf during their trip. Reflection Bay, a Jack Nicklaus Signature course at Lake Las Vegas Resort also holds a notable record. The smartly designed layout plays around the largest man-made lake in Nevada (holding three billion gallons of fresh water). “We have now partnered with Southshore Country Club, carved into the rugged hillside, for the opportunity to ‘double down’ and play two of Jack’s best designs during your trip,” revealed Dutt. “We provide a more relaxed, less frantic setting. You feel removed, yet in less time than it takes you to finish your Starbucks coffee, you can be on The Strip. 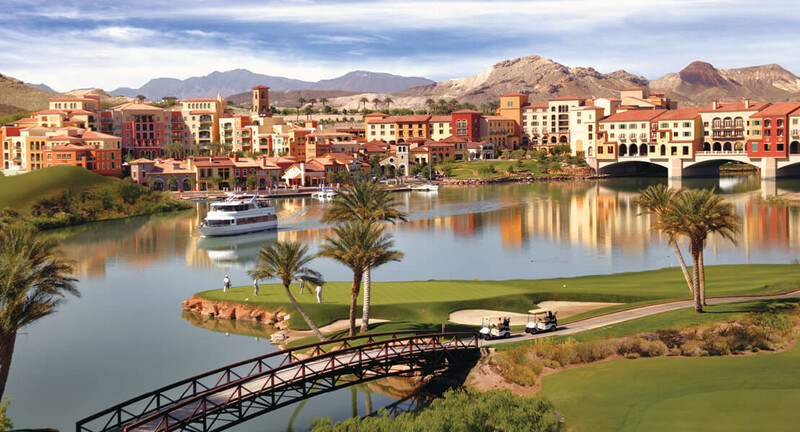 I like to refer to our golf destination as the ‘Palm Desert of Las Vegas.’” For more: www.LakeLasVegas.com. The Ocean Course at Kiawah Island Golf Resort has long been recognized on the world’s stage of a resolute test of golf. It’s interesting to note that The PGA of America approved Kiawah hosting the 1991 Ryder Cup on the Ocean Course before the design was completed. It showed the confidence the organization had in the resort’s location and ability of Pete Dye. In the past three decades since the memorable American versus European “War by the Shore” matches, Kiawah Island Golf Resort has grown rapidly. Demand led to expansion and opening of The Sanctuary, a perennial AAA Five-Diamond and Forbes Five-Star award winner; five golf courses; 24 tennis courts of which 19 are clay; 10 miles of sandy shoreline; and 500 rental villas ranging in size from one to eight bedrooms. In order to maintain its reputation as the golf destination along the East Coast, a seven-year plan was set in motion to upgrade all courses. Jack Nicklaus, Pete Dye, Tom Fazio, and Gary Player had a “meeting of the minds” with the golf team suggesting improvements. The hard work is now bearing fruit with the last course renovations completed. More: www.KiawahIsland.com. The Super Bowl will have 80,000 fans in attendance cheering for their team. Impressively, this weekend’s Phoenix Open at TPC Scottsdale – nicknamed the “greatest show on grass,” will likely attract over 700,000 spectators that will pump an estimated $389 million into the local economy. More: www.ExperienceScottsdale.com. French Lick Resort, with two sister hotels—the West Baden Springs Hotel and the French Lick Springs Hotel—first welcomed guests in 1845. The AAA four diamond property has invested over $600 million in recent years. Amenities include the largest resort conference center in the Midwest; a full-service casino; two spas; the Kidsfest Lodge; a bowling alley; and 54 holes of golf, including Donald Ross and Pete Dye Signature designs. Building the Pete Dye Course at French Lick Resort was an ambitious project. Crews had to utilize a Caterpillar D-10 bulldozer to contour rugged terrain. The 230,000-pound monster of a machine has the capability to level a small house in a single pass! More: www.FrenchLick.com.